I moved into my own apartment — my first apartment! — during my junior year of college and suddenly had access to a full kitchen. No more dining hall meals for me! It was the first time I’d been completely responsible for cooking for myself, and I experimented a lot. I made chicken satay 100% from scratch, scouring the hole-in-the-wall Asian shops in Syracuse for ingredients and pounding fresh lemongrass to make homemade curry paste. I stocked my freezer with double batches of homemade pesto in the summer, and stole permanently borrowed Natural Food Feasts — a much-adored cookbook that sits on the my shelf right now — from a friend of a friend of a friend so I could try my hand at Indonesian food and Middle Eastern recipes that weren’t part of my family’s repertoire. One of the recipe cards that survived the transition from my college apartment through a short stint living with my mom in Escondido, California; then on to my own place in Sausalito; and finally, to the houseboat where Dave and I lived when we were a new couple — whew! — was a simple, one-pot meal for creole ham and rice with kidney beans. We ate that dish at least once a week because it was easy and cheap to make. I’ve been revisiting old recipes as I gather inspiration for our next cookbook (coming in October 2016! ), and I found the recipe card for the creole ham and rice. When I got over the shock of realizing I’d been carting that recipe card around for almost 25 years, I realized it would be pretty simple to make a paleo-friendly version. I could get our old favorite back on the menu! I ditched the kidney beans, replaced the rice with cauliflower, and came up with a ham-free version for Whole30-ers. The best news of all is that it’s still dead-easy to make — it’s based on my recipe for Oven-Roasted Cauliflower Rice. You just toss the ingredients with flavored fat and throw the whole shebang into the oven for half an hour. 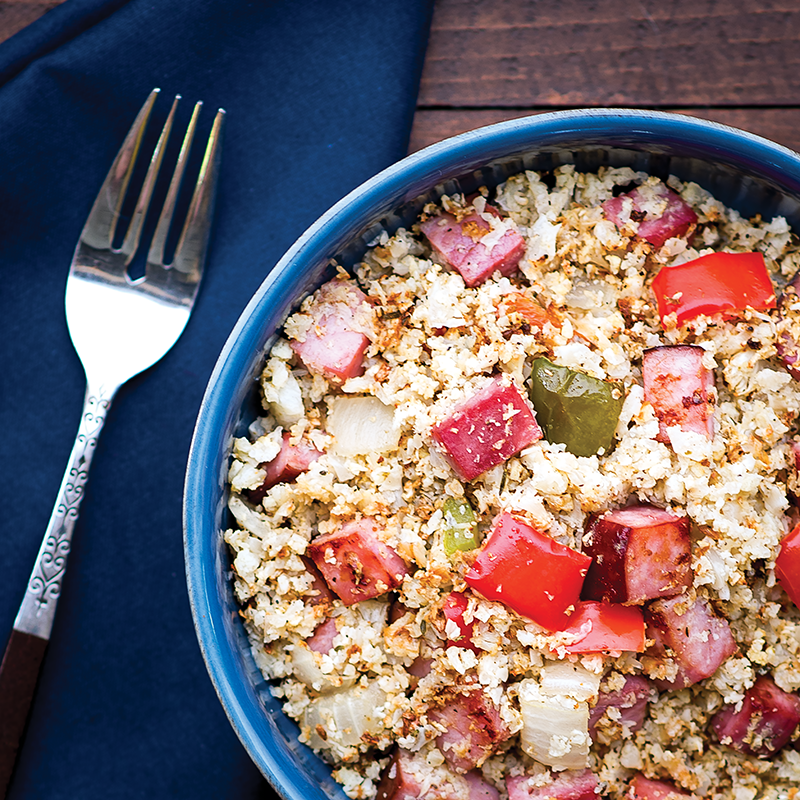 The thyme, cayenne, and celery seed are flavorful without being overwhelming, and the cauliflower rice becomes the ideal combination of tender and caramelized in the oven. Alone, this is a good dose of veggies, but if you want to double-down on plants, this is super tasty with a side of steamed green beans tossed with olive oil and garlic. You could also serve your pile of creole rice on a bed of raw baby spinach leaves; the heat of the cauli rice will warm and tenderize the leaves. It’s also worth noting that this is an excellent way to use up leftover Easter ham. Break the cauliflower into florets, removing the stems. Place the florets in a food processor and pulse until the cauliflower looks like rice. This takes about 7 to 10 one-second pulses. You may need to do this in multiple batches to avoid overcrowding. Place the riced cauliflower in a very large mixing bowl. Add the ham, onion, and bell peppers. Toss with a spatula or two spoons until everthing is evenly distributed. In a small bowl, combine the fat, garlic, salt, thyme, black pepper, cayenne, and celery seed. Mix, then pour over the cauliflower. Toss for at least two minutes so the ingredients are evenly coated with the flavored fat. Divide the rice between two large, rimmed baking sheets (or a roasting pan) and roast in the oven 30-35 minutes, stirring about halfway through the baking time. At the end, the cauliflower should be tender, with little brown bits beginning to appear. OPTIONAL: For added caramelization, zap each tray under the broiler for about 2 minutes after the baking time is up. This looks like a super-tasty recipe, and the perfect landing spot for leftovers from the Kalua Pig I’ll be making (thanks to Nom Nom Paleo) for Easter dinner. What an amazing idea! I need to make Kalua Pig and put the 2 together! This was a true winner for my family. Every bite was devoured – even by my pickiest! I made this last night for my lunches this week. Unfortunately my local Whole Foods didn’t have lard (and I didn’t have time to procure any from any other source), so I used coconut oil. It’s still really good with coconut oil, but it would be spectacular I think with lard. I did the Whole 30 compliant substitution. The pork is a little bit dry, but because I used a lot of veggies and served it over a bed of spinach (as suggested), it wasn’t a big deal. Thanks so much for your delicious recipes! I’ve tried several and have been thrilled with all of them. I’m glad you liked it! I’ve made it with coconut oil, lard, and duck fat on different occasions, and it’s all been yummy. I had a lot of ham from Easter and drooled when I saw this but I am AIP. I tweaked it by changing the spices to salt and garlic powder. Also, added carrots, celery, and pineapple to the mix instead of the peppers. YUM! Thanks for the inspiration. I order dried cauliflower and grind it dry than rehydrate it and have rice size particles. I then saute it in olive oil with onions and it tastes wonderful!! It’s my new “rice” side dish. I have reserved bacon grease/fat in a coffee mug in my fridge, I bet that would be tasty with this, too. I have everything but the ham for this recipe. I might be stopping at the grocery store on my way home tonight!! I used a head of purple cauliflower and a head of white. Used bacon fat and topped with green onions after it was done. So frigging delicious!! Right on! Glad you liked it! Awesome. My husband said he felt like he ate healthy without sacrificing anything…and I agree. So flavorful and pretty. And most importantly, I’m stuffed! I put on top of collard greens made in the pressure cooker with bone broth. This will be happening a lot! Hooray! I’m glad it was a hit! I bet it was awesome on top of collards. OMG! This was amazing! My family was singing its praises before I had even sat down at the table. My 7 y/o begged to take this for his lunch today at school. Outstanding recipe! I’m so glad you all liked it! And the request to take it for school lunch? That is high praise. YAY! I just found a sugar-free ham on US Wellness Meats. I can use this and it will be whole 30 compliant right? YES! According to this http://grasslandbeef.com/sugar-free-ham, the only ingredients are pork, water, and sea salt. AWESOME! I stumbled upon this recipe yesterday, made it for dinner last night, and it was AMAZING!! I’m in my second Whole30, am putting a lot more work into switching up my recipes, and am loving every second of discovering recipes like this one! My boyfriend (who doesn’t care to try the Whole30, but who totally supports it…) couldn’t stop telling me how delicious dinner was. So, in sum–a big THANK YOU for recipes like this. Keep them coming! I’m so glad you and your BF enjoyed it. Happy Whole30ing! This is a keeper! I had saved it months ago, forgot about it, and stumbled on it again just recently. I used one huge head of cauliflower and it seemed to be plenty (took me two batches to rice it all in my food processor). Because it’s me, I also had to double the garlic and go a little extra on the spices and onion, and it was outstanding. Thanks! Really dumb question – if I’m subbing porkchops would I cook them first or will they cook while everything else is cooking? Not a dumb question! You can just cut the raw pork chops into cubes, like you would with the ham, and follow the rest of the instructions. The pork roasts and browns in the oven, along with the cauli rice. Enjoy! I subbed in porkchops and the dish turned out to be fantastic! Such great flavors. Thanks so much! Right on! Glad you enjoyed it. Thanks for letting me know! It seems like the cooking time is quite a bit longer than for the usual oven-roasted cauliflower rice. The cauliflower doesn’t end up overcooked? This has become a weekly meal. 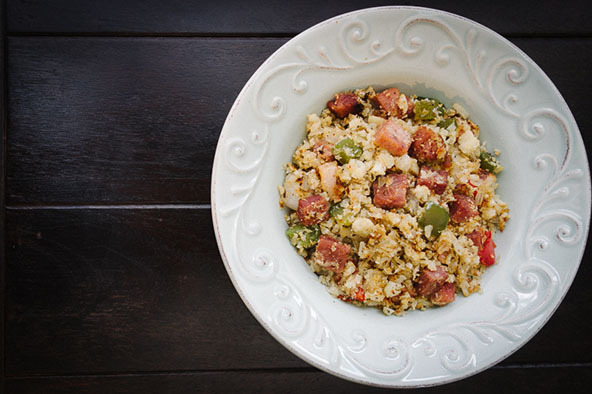 Sometimes I make it with the pre-packaged cauli rice, but tonight we did it fresh with polish sausage, onions and peppers. Garam Masala or Italian spices change it up. So much better when I bake the cauli in the oven. Thank you Melissa!